This DVD is designed for beginners, fitness enthusiasts, personal trainers, physical therapists, chiropractors, coaches, and athletes of all sports. US Olympian Buddy Lee Official Conditioning Consultant to 25 Olympic Sport Teams and World's Leading Jump Rope Training Expert teaches his proven system to people of all fitness levels and abilities to a low impact, progressive, safe, challenging and fun way to jump rope. His training system is endorsed by millions around the world to include Olympic Gold medalists. 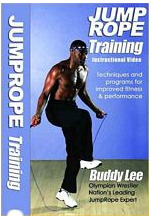 The DVD teaches you how to jump rope the right way to improve your health, fitness and/or sports performance. In 4 easy steps Buddy will teach you how to master the skill of jump rope, achieve correct posture, form and take off & landing technique (jumping only 1 inch off the surface). He will help you to become jump rope proficient, and then build up to 500 jumps, to 5 minutes of jumping and eventually to 10 minutes of jumping non-stop. According to research, 10 minutes of jumping can provide the same cardiovascular benefits as 30 minutes of jogging. In addition Buddy will show you how to maximize your jump rope training by demonstrating his 15 key techniques and specialized programs designed for developing superior fitness, toning, trimming, weightless, improved reflexes, balance, coordination, endurance, rehabilitation and improve athletic performance. Complete jump rope instructional DVD for anyone learning how to jump and would like to improve their technique, speed and overall fitness. (27 min. long). Gina Lombardi, Fit TV star, says "it is the best video I have seen in a long time." Highly Recommended!